As Healthy As Can Be! Take the pizza game to a higher level. 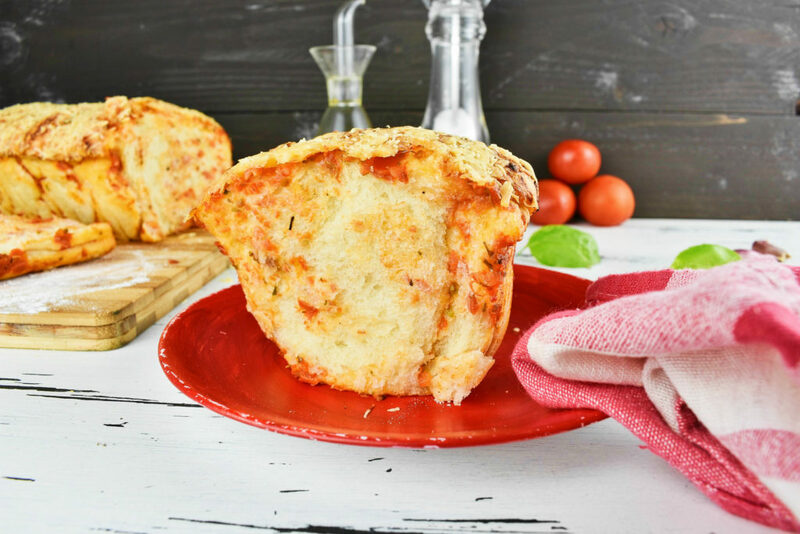 Tall, fluffy and spongy pull-apart bread coated with pizza sauce is simply out of ordinary. Pizza is an Italian dish with origin spun out of the memory of mankind and never to return. It’s not that of a big deal tossing a bit of pressed dough onto something flat to bake on; no wonder no one made the effort painting it on a cave’s wall. This type of bread was so common that even ancient soldiers on their battle shields could prepare it during war times when they got bored of the canteen food. Sure, enough not every flatbread is pizza but every pizza is flatbread. The devil is in the details or so goes the saying and it’s true enough here as well. Pizzas traditionally made in wood fired brick oven on high temperature. This makes it fairly hard to replicate the true Italian pizza style in a boring sort of low temperature home oven. If we don’t want to build a wood fired oven in our backyard or on the terrace of our 9th floor apartment to enjoy pizza whenever we fancy, then we have to put up with a simple pizza stone in our electric oven and the imperfections of our pizza. Sure, enough we can order pizza as well which makes life much easier and cooking faster with plenty of time watching something on Netflix or wherever. Unfortunately, ordering pizzas will leave us with little room to choose ingredients we want in them and parch our creativity to death with toppings and flavors. No-one could have invented deep dish pizza if only had the chance to order the same ones over and over again. Beautiful things were born under the low humming noise of the kitchen air extractor. Experimenting with toppings is a cool way to explore our soul and find the perfect harmony in something totally unexpected and kind of strange. But we shouldn’t stop there. When we break fundamental rules or forms, our creation shouldn’t be called something that is only remotely resembles the original. An excellent example of this is Chicago style pizza which is nowhere near to a pizza but only in topping. We should wonder why isn’t deep dish pizza called pizza pie but seeing that 13% of the USA population eats pizza on any given day there’s no surprise everyone would like to serve them one even if it is pie or in our case bread. 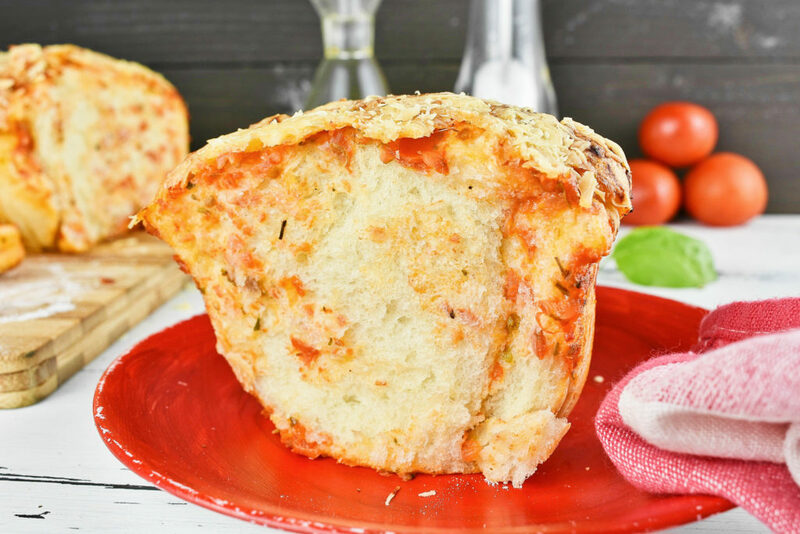 So why not go wild with pizza toppings and try it on some awesome, spongy and fluffy something like tear and share bread? With tomato and some herbs, we can’t go really wrong after all, can we? Actually, tomato on bread has some great tradition in these Mediterranean countries. 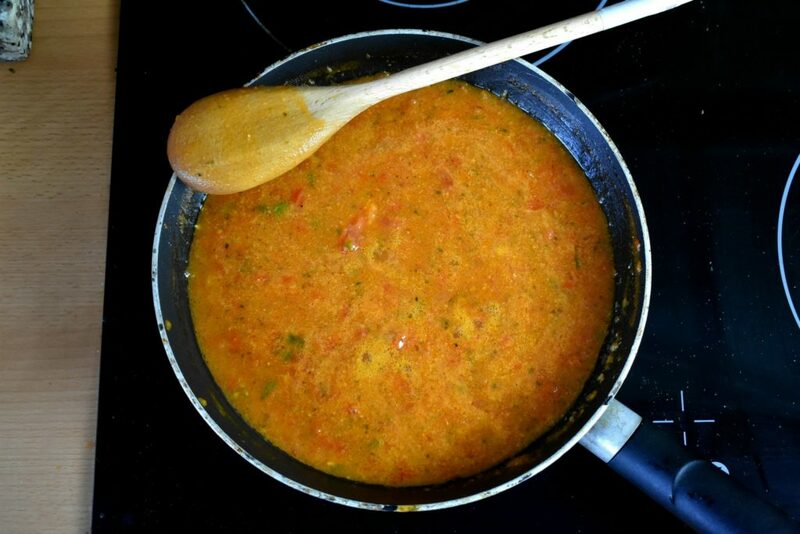 In Spain people mash, chop or spread tomato on a slice of olive oil-soaked bread. With a pinch of salt and pepper. It’s a divine breakfast at 10am. Tomato is a great antioxidant and associated with protecting against cardiovascular disease and various types of cancer, as well. Given it’s consumed with its natural form without added sugar, preservatives and such. 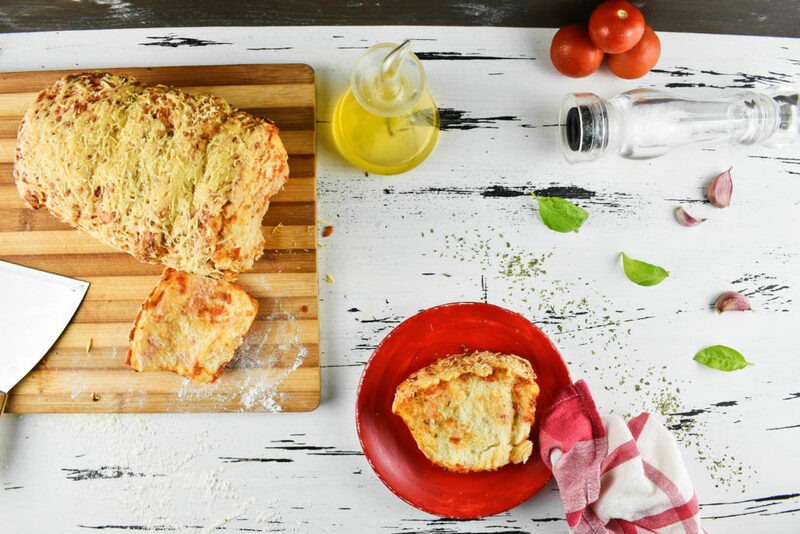 As pizza is part of the Mediterranean diet (Italy is part of the Mediterranean coast, practically) we can say that it is a healthy food if consumed with moderation of course, same as this tear and share pizza bread. It is made out of almost the same ingredients as the pizza crust but the olive oil was swapped to butter and it consists some milk as well. It gives the bread a bit of sweeter buttery scent. If we are after dairy free tear and share pizza bread then olive oil and water can be used as it is with pizza. Otherwise all our favorite pizza toppings can be used although there are some limitations. It’s fairly hard to stuff chunks of meats and vegetables between the layers. 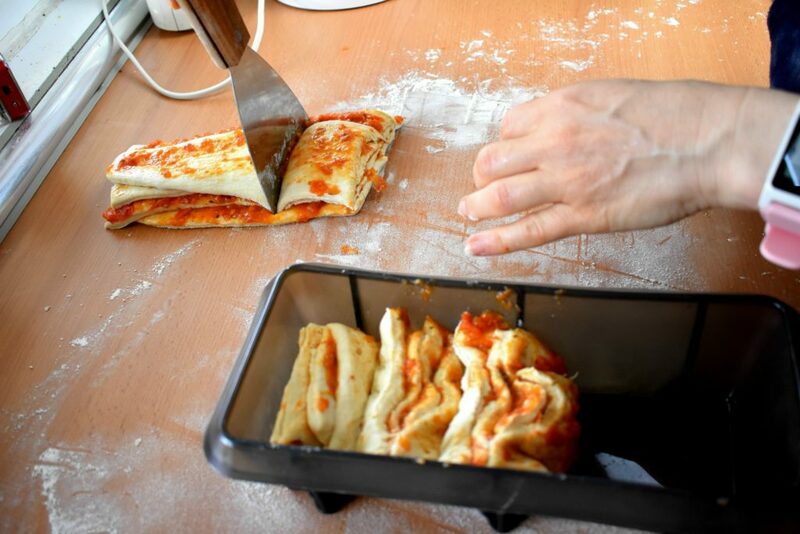 It is even harder to pull them apart after baking pizza bread, not to mention the ingredients have to be cooked well. We have to take into account that big chunks of ingredients like meat or vegetables probably need some extra preparation like chopping and mashing before we are able to spread them between the layers. Put the fresh yeast into a half cup of lukewarm milk. Set it aside until it gets foamy. It takes more or less about five minutes. Get a big bowl and put flour, sliced room temperature butter, egg and the lukewarm water in it. Pour the yeasty milk into a big bowl on top of the other ingredients. Knead the mixture well until it’s even and there’s no flour left on the edge of the bowl. In the meantime, prepare the filling. 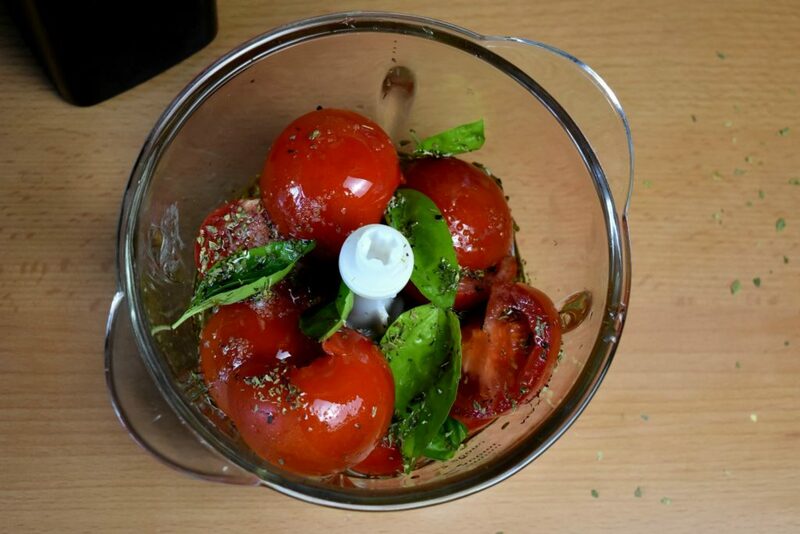 Chop tomatoes, basil, oregano, salt and olive oil in a blender. Pour it into a pan, bring it to boil and simmer it for half an hour while stirring occasionally. Take it off heat and let it cool down somewhat. Pouring hot sauce on the dough would make it gooey which it hard to handle and ruin our day. For more detailed instructions with photos check out our tomato sauce recipe at the Low Carb Condiments. After an hour waiting take dough out of the bowl onto a lightly floured work surface and roll it into a 12 inch / 30cm square. Flouring underneath the dough is important as this coating will prevent it to stick down. 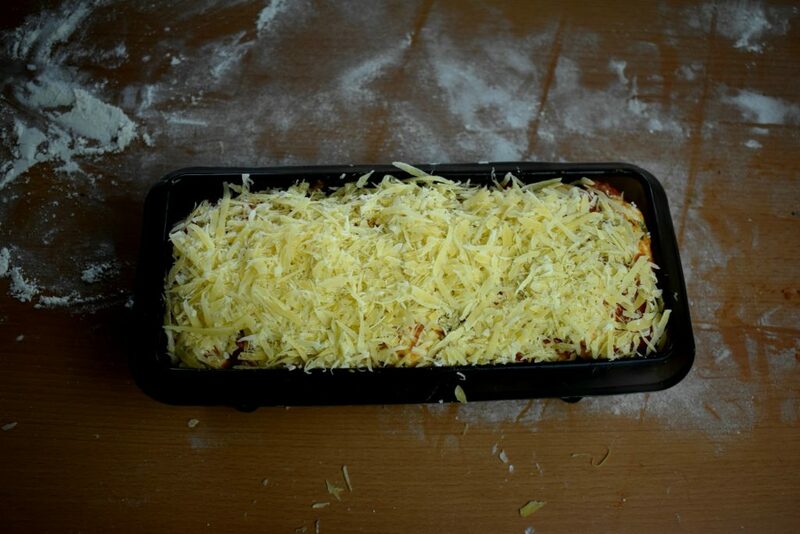 Spread the coat of preferably room temperature tomato sauce evenly on the top of the dough. Cut the square into 4 equal strips and put them on top of each other. This may be trickier as it sounds if the dough sticks to the counter. Use a plastic scraper to help getting the dough off the worktop if it’s necessary. 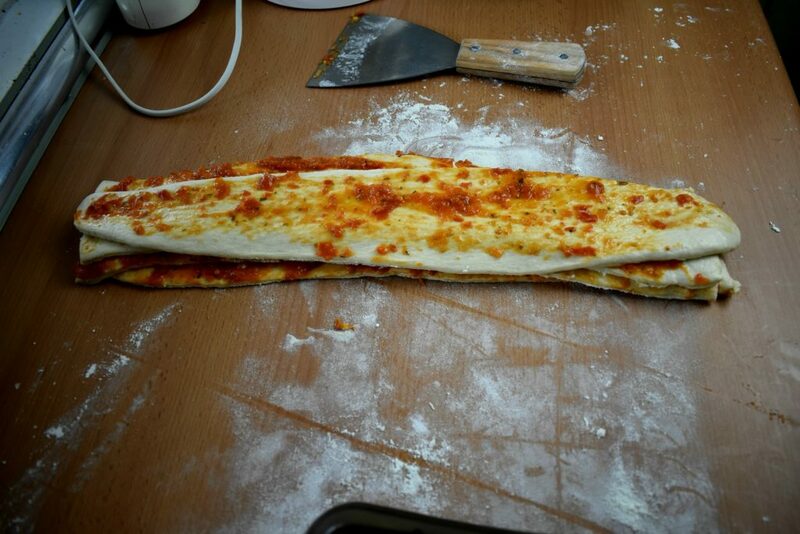 The dough is quite soft so try not to pull it more than necessary. When they are evenly on top of each other cut them into as wide rectangles as the bread tin. Fill the bread tin rather loosely. If it’s packed too tight, the dough will bake together and we won’t be able to tear the bread. Spread the rest of the tomato sauce on top evenly. Leave it for another 15 minutes to rise. Meanwhile grate the cheese and turn the oven on to preheat it. 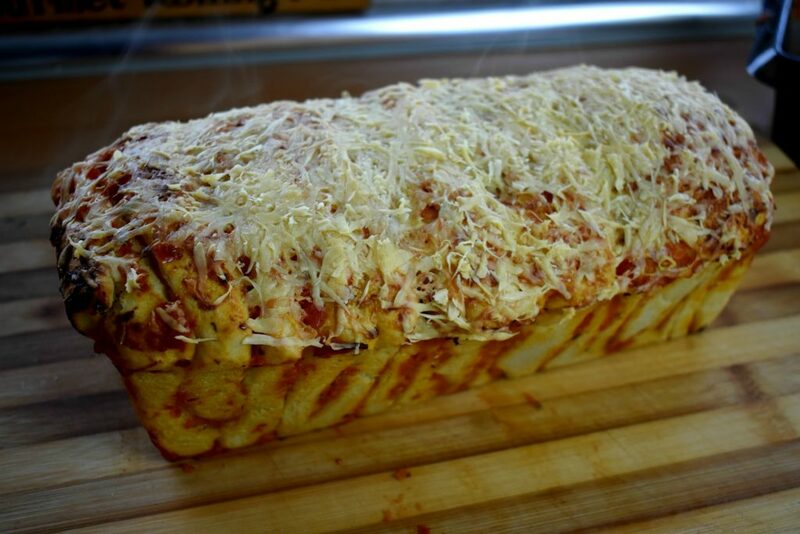 After 15 minutes sprinkle the cheese on top of the bread. Pop it into the preheated 365°F / 180°C oven for half an hour. 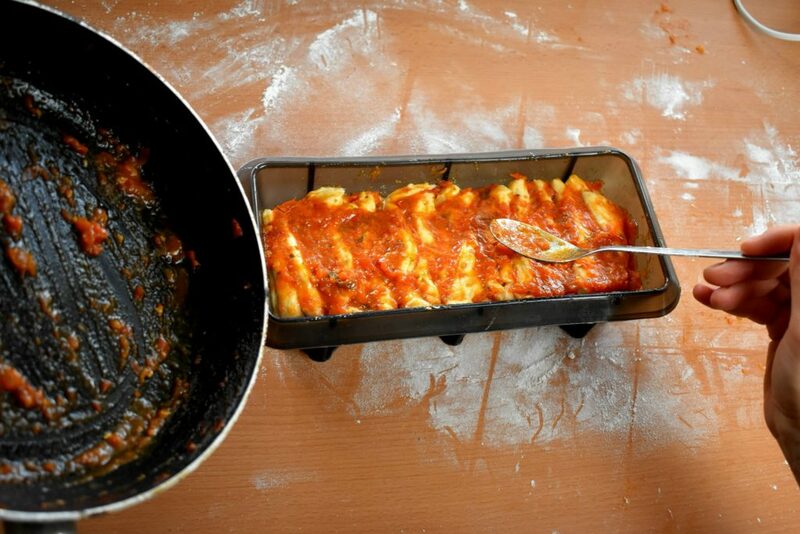 In some cases they can be baked earlier, in other ovens it would take 40 minutes to be ready. So it is worth to check after 25 minutes. Get a fork or a toothpick and poke the bread if no dough is left on the toothpick we can turn off the oven and take the bread out. Leave them cool down a bit before serving. X-gen Master of the rolling pin, mother of the ONE and a full time teacher. Kneading out the every day life nuisances under the low humming noise of the airflow oven.